ItsOKtobeYOU.org - Your Kristen Stewart Fansite & Source: North American Premiere of 'Café Society' to be at the 2016 Seattle International Film Festival on May 19! 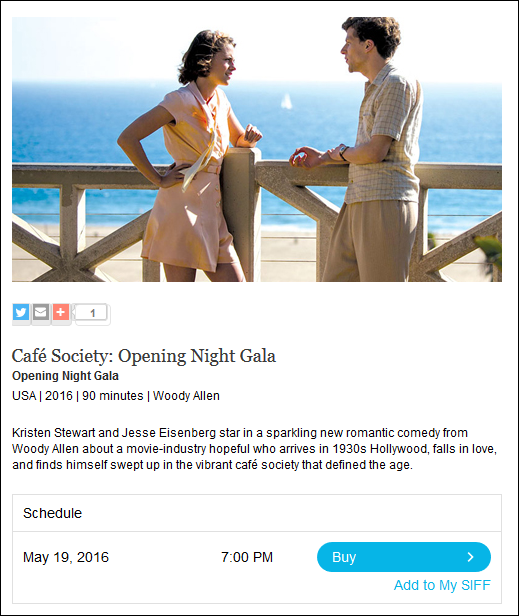 North American Premiere of 'Café Society' to be at the 2016 Seattle International Film Festival on May 19! • THR: The film will have its world premiere at Cannes, but its North American debut will be in Seattle. Woody Allen's latest film, Cafe Society, will be featured during the Opening Night Gala of the 2016 Seattle International Film Festival. "Woody Allen delivers a delightful, vibrant and entertaining tale that continues to expand his repertory of acting talent. Combining the power of SIFF, which boasts the largest audience of any film festival in the country, with an emerging Seattle-based film distribution powerhouse that firmly believes in the theatrical experience, along with one of our most acclaimed directors, is a perfect match," said festival director Carl Spence.